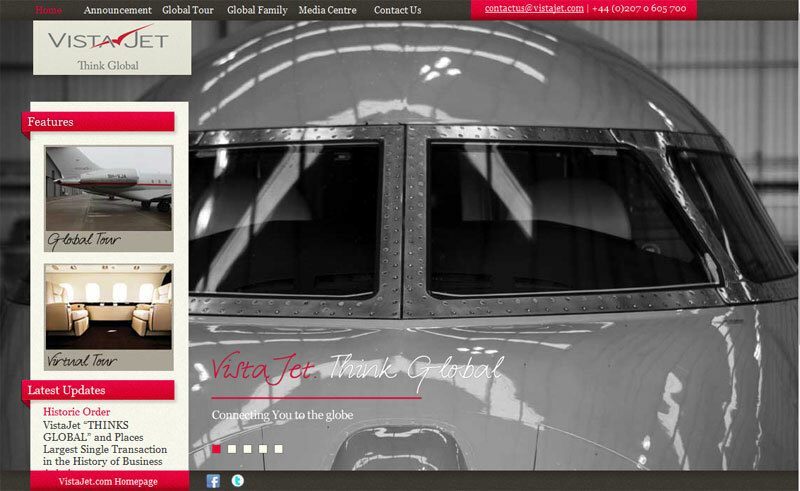 VistaJet is an international private jet charter company based in Saltzburg, Switzerland. When VistaJet placed the largest single transaction in the history of business aviation they chose Spacecake to develop and build the associated website. The site was developed and built within the required timeframe and budget. About VistaJet VistaJet is the world’s fastest growing private aviation company, with the largest wholly-owned commercial fleet outside the Americas. VistaJet uses new aircraft, all operating under warranty from industry leading manufacturer Bombardier. The whole fleet represents the highest levels of luxury, safety and security. VistaJet is committed to minimising the effect of flying on the environment. This is achieved through their state-of-the-art fleet featuring the latest technological advances and designs to deliver optimum efficiencies. VistaJet has a comprehensive Bombardier fleet throughout Europe, Middle East and Asia. The company is headquartered in Switzerland with offices in Salzburg – Austria, Dubai – UAE, Kuala Lumpur – Malaysia, Hong Kong and Farnborough – United Kingdom. Thomas Flohr – who founded and wholly owns the company – is fully committed to the highest operating standards and the long-term development of the business.